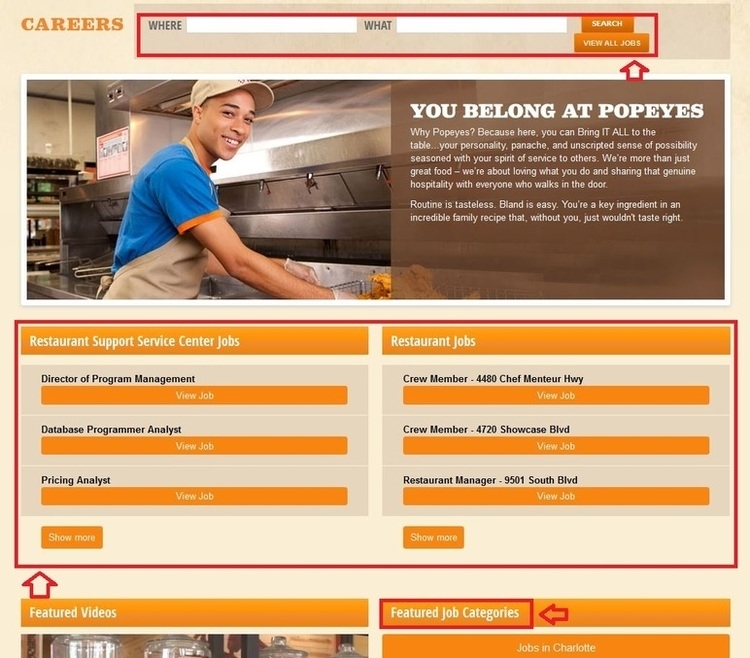 To apply for job at Popeyes, you need to visit its official careers site - popeyes.jobs or popeyes/careers. 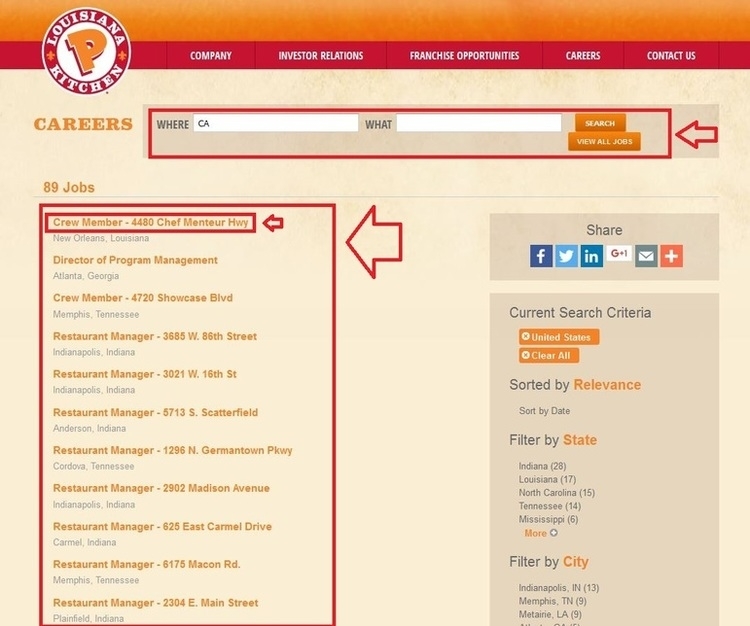 You can view jobs at restaurant service center and restaurant, or select jobs based on the featured job categories. Watch the video by associates working for Popeyes to learn about careers at Popeyes. View all jobs to pick up the one you want or use the search box on the top of this page by entering the location and keywords like job title, and click on the search button. Enter where you want to work and what kind of job you like, and click on the button of “SEARCH” to view the results that would be listed right on this page. Or you can view all jobs by clicking the tab under “SEARCH”. Select the job you would like to know more by clicking on the job title. Learn about the job description before you start your application process. Click on the link of “Apply Now” to apply for the job, or you can search for another job by entering the search criteria again. Read the details of the position like required knowledge, skills and abilities, essential responsibilities, and other information, and click “Apply to job” to proceed your application. An account will do you a great favor in applying for jobs at Popeyes. It will take you a few minutes to create a Popeyes account, you need fill in a valid email address and passwords, select three security questions and provide the answers. You are required to complete a total of seven steps to apply for jobs at Popeyes. To complete the application, you need to create a profile and fill in the general information, additional information, and source information, etc. 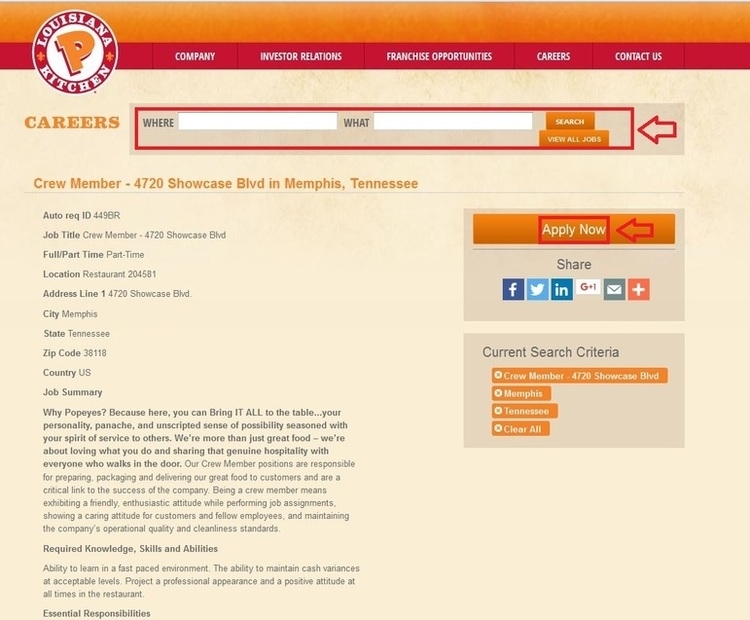 Click popeyes.com/careers to apply for Popeyes jobs online.